I have just returned from Washington, DC, where I attended the CARE National Conference. In the nation’s capital I spent 2 days learning about critical issues that affect women and girls worldwide, culminating in a day spent lobbying my members of Congress on Capitol Hill to improve these conditions. CARE is one of the world’s largest humanitarian aid organizations, working in about 70 countries worldwide. Known for their disaster response efforts the past 65 years, most of their work now focuses on international development and long-term solutions to problems such as hunger, disease and poverty, with a special focus on empowering women and girls. In Tuesday’s opening plenary, CARE’s President and CEO, Dr. Helene Gayle, remarked that we “live in a world of paradoxes.” Our world now has more billionaires that ever before, but over 3 billion people live on less than $2 a day, the majority of which are women. We live in a country struggling with an obesity epidemic, yet over 1 billion people around the world go to bed each night chronically hungry. Without the use of teleprompter or notes scribbled on her hand, Secretary of State Hillary Rodham Clinton delivered a powerful keynote address. She stressed that development is a critical component of U.S. foreign affairs, “right up there with defense and diplomacy.” Highlighting nutrition as one of the best solutions to saving lives, Secretary Clinton outlined a new strategy of the Obama administration to address this issue in the chronically hungry through food aid targeting babies in the first 1,000 days of their lives – from the moment of conception until the time they are nearly 3 years old. “If you want to know how stable a country is, don’t count its weapons, count the number of undernourished children,” Clinton stated to the 800+ member audience. 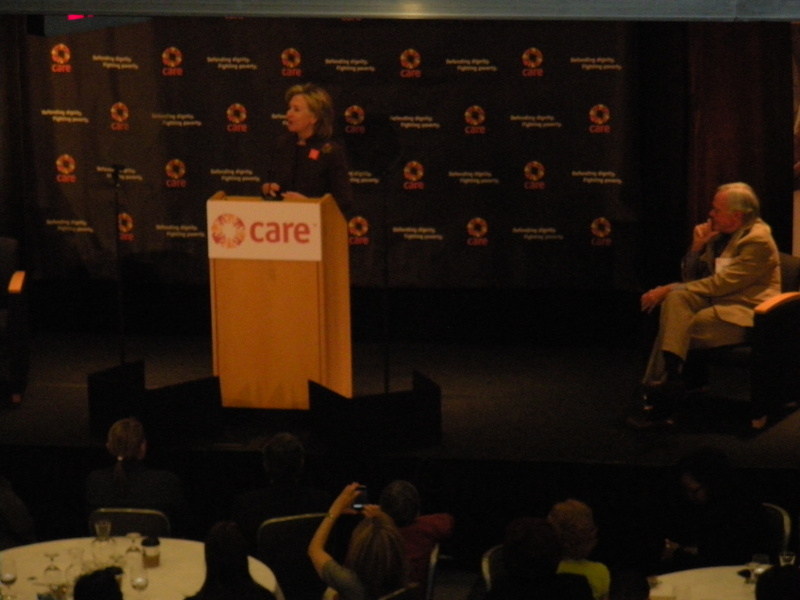 During her keynote address, Secretary of State Hillary Rodham Clinton told CARE advocates, "talent is universal, but opportunity is not." 1. Fighting Global Hunger with a Global Food Security Initiative (H.R. 3077 and S. 384). With around one-sixth of the world’s population suffering from chronic hunger, long-standing food aid programs haven’t been adequate in addressing it. This bill would focus on long-term agriculture development and food security by using a more localized approach, rather than shipping thousands of tons of food aid from overseas. 2. Protecting and Empowering Girls by Preventing Child Marriage (H.R. 2103 and S. 987). Over 60 million girls under the age of 18 are married in developing countries. Child marriage limits a girl’s opportunity to complete an education, leads to an increased risk for sexual and physical abuse and an increased risk for HIV. This bill would help countries with high rates of child marriage to enforce their own laws. For example, in Bangladesh the legal age for marriage is 18, but many girls are married off by the age of 10. 3. Protecting mothers and children from senseless deaths (H.R. 5268, not yet introduced in the Senate). Every 52 seconds a woman dies in childbirth. In some countries, such as Afghanistan and Sierra Leone, a woman has a 1 in 8 chance of dying in childbirth in her lifetime. This is in comparison to 1 in 4,800 women who die in childbirth in the United States and 1 in over 17,000 in Sweden for lifetime risk. This bill would require our government to create a comprehensive strategy for addressing maternal health, and create greater cooperation within the different federal agencies working on this issue. 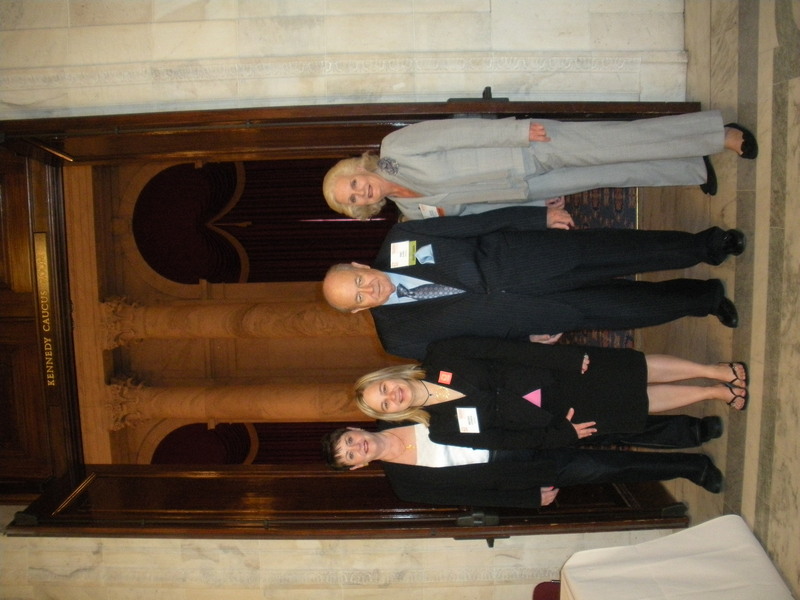 A group of 5 CARE advocates from Nevada met with staff of Sen. John Ensign, and personally with Sen. Majority Leader Harry Reid, Congressman Dean Heller, Congresswoman Shelley Berkley, and Congresswoman Dina Titus. None of the Nevada members of Congress have yet signed on to these bills, but we’re optimistic that our elected officials will act to make the world a better place for woman and girls. Throughout the conference, we were told many personal stories about women and girls whose lives have been touched by successful humanitarian aid programs. There was Goretti from Burundi, who struggled in her early years of marriage with being allowed to leave the house and asking her husband’s permission to have money or do any activity on her own. With the help of a Village Savings and Loan Program, she is now operating a sucessful banana beer business and her husband asks her to borrow money. There was the tattered health clinic in rural Tanzania where many women go to deliver their babies. With the help of a grant from CARE, they were able to purchase a tricycle ambulance. If any woman faces complications during childbirth, the ambulance is able to transport her to a health care facility 4 hours away where she may get an emergency C-section. You may think 4 hours in labor while riding in the back of a tricycle-steered wagon may be an impossible situation, but before this vehicle was available there was nearly no hope for the woman’s survival. There was also the 10-year-old girl from Maine who, together with several of her friends, wrote letters to their members of Congress describing how they would feel if they were forced to leave school and get married. It may sound preposterous for that to happen in the United States, but it is happening in many developing countries, predominantly out of economic desperation. This young girl from Maine also raised her own way to the CARE conference through bake sales, and was so successful that she was also able to donate an additional $200 to assist CARE programs. This empowering story shows us that any one of us can do our small part to make a difference. This entry was posted in Becky's Activism and tagged advocacy, Capitol Hill, CARE, CARE National Conference, child marriage, food security, Hillary Clinton, hunger, lobbying, maternal health. Bookmark the permalink.